LimoWiz users are able to dispatch job information directly to drivers mobile devices from the software, allowing you to interact with the data and communicate job statuses back to the dispatcher within 60 seconds and displayed on the LimoWiz dispatch window. Sample LimoWiz Dispatch Window where is trip status is updated. Driver can see trips (jobs). Trip #, Time, Trip Status, Passenger Name, Vehicle, Service Type and number of bags. A zoom icon to see trips details including Total Due and Pay Method. See previous day, today and next day jobs or based on a selectable trip date. Set trip status and update it. See full routing details with ability to check flight status if airline icon is visible on right hand side of routing line. Call passenger and send SMS. Map street address from current driver GPS location up to 10 select selectable or manually routing lines. View step by step directions and time and distance. Fully manage your limousine, car or livery service business efficiently. GPS tracking*, and much more. LimoWizOnline is enables you to place a "Online Reservations" button on website. Your customers to make online reservations, request price quotations. 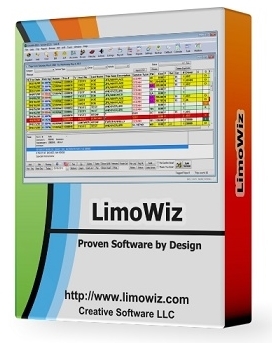 It allows you to manage those requests, then download them to LimoWiz desktop using LimoWizOnline Download Utility program. Instantaneous credit card processing without any terminals. It is fast, secure using any of the supported payment gateways. Integration is designed to be efficient and complete.